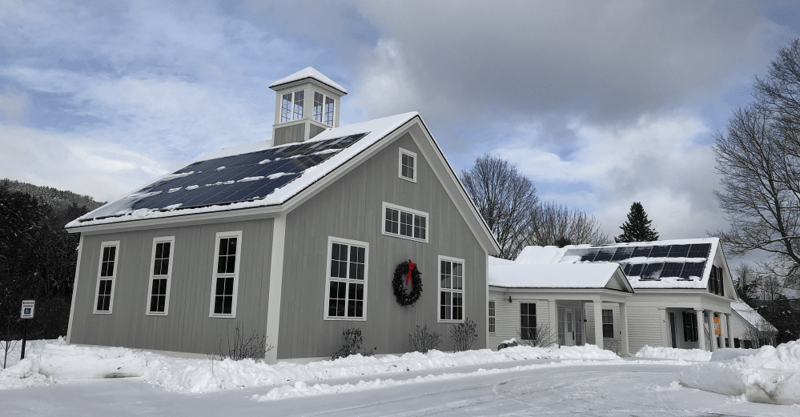 The Unitarian Universalist Church of the Upper Valley in Norwich already had electric power donated from a working solar system when it decided to mount another on the rooftop. One of the factors in the decision was that its new building had beautiful south-facing roofs, and people thought it would be a shame to let it go to waste. The new system is a community solar array, with church members participating in net metering. This system has 45 solar panels, each of 350 watts, providing a total power of 15.75 kW DC. It includes 45 SolarEdge P400 Optimizers and a SolarEdge HD Wave SE11400H-US inverter. The racking is IronRidge XR-100, using EcoFasten QuikFoot attachments. The UUCUV system was completed in 2018. Its members blessed the panels on Sunday, December 30th. Click here for media coverage of this project. Equivalent to carbon emissions from burning:179 tons of coal, or 964 barrels of oil, or 46,472 gallons of gasoline. Norwich Solar Technologies provides complete end-to-end solar solutions to businesses in Vermont and throughout New England. Join our mailing list to receive information on everything solar. Norwich Solar Technologies will never share or sell your information with anyone. It is only used for our direct communications with you. You can opt out at any time. Request a FREE site evaluation and consultation!